Want some jungle fun in the tropics? 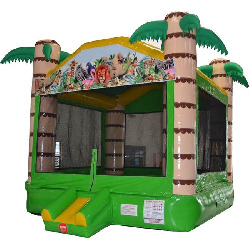 There's no better place for it than in the beautiful Tropical Bounce House. Bright colors and exotic animals are part of this jumper's appeal, offering a 360 degree design with 4 tall palm tree posts and a jungle animal themed panel above the entrance.